"Verily! this Qur'an guides unto that which is straightest, and gives glad tidings unto the believers who do good works that theirs will be a magnificent reward." Note: The main sources of the following information were the books "Al-Seerah al-Nabawiyya" by Ibn Hisham, and "Al-Seerah al-Nabawiyya" by Abu-AlHasan Al-Nadwi. Other sources were used as well. In the sixth century AD, at the time of the birth of Muhammad (pbuh), the Arabian Peninsula was surrounded by a number of great empires. These empires were in a state of constant conflict, waging wars and claiming territories. The boarders of nations were constantly being redrawn, and at times whole nations would crumble under the advancing forces of a more vicious and powerful neighbor. However, in an age when the people of all of these nations had become accustomed to countless rulers, conquerors, philosophies, and religions, throughout all of this, Allah Almighty saw fit to protect the Arabian peninsula from these forces and allow its inhabitants to roam free, with great pride in their freedom, never bowing to man-gods or rulers who claimed to be "incarnations" of mythological gods such as had become the fate of the Persians, the Romans, the Hindus, and many other nations surrounding them. Although steeped in paganism and idol worship, theirs was a simplistic and very basic sort of paganism as compared to the infinitely more complex and multifaceted paganism of the multi-cultured nations surrounding them, their religious philosophies, and their untold rituals. The situation the Roman empire has been dealt with in some detail in previous chapters, so it will only be dealt with very briefly here (see chapters 1-3). The situation the Roman empire was far from enviable. The Byzantine Empire (the eastern part of the later Roman Empire), became a land of crippling taxation and rampant bribery. The citizens had become so frustrated with their miserable condition that civil unrest and rioting became commonplace. In the year 532C.E., during the rule of Justin I, only one single such riot resulted in the death of over thirty thousand citizens in the capital of Costantinople. During this period, the amassing of material wealth and money by any means possible became a virtual obsession. The religious elite had become severely intolerant of unconformance to their beliefs and this resulted in massive bloodshed and campaigns of persecution. The rulers immersed themselves in all manner of luxury and indulgence, caring little what the cost of their entertainment might happen to be upon the citizens. Recreation and amusement consisted of blood sports of the utmost viciousness. Up to 80,000 people at a time would attend these events in huge coliseums in order to amuse themselves watching battles to the death at times between men and men, or at others between men and lions or other man-eating carnivores. 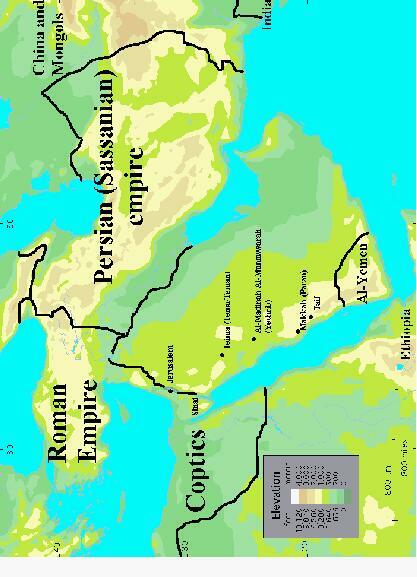 Egypt supplied both the grain that fed Rome and much of the government's revenue. The empire sucked this lush and fertile farm land dry under crippling taxation, tyrannical rule, and religious persecution in order to maintain the extravagant lifestyles of the elite ruling class. This sad state of affairs was no better in Syria which was ruled with an iron fist resulting in taxation so severs that the citizens found no recourse but to sell their children into slavery in order to pay their taxes. Map 1 Middle-eastern region during sixth century C.E. Zoroastrianism was the official religion of the Sassanian empire during this period as it had been the faith of the Persian kings since it was founded in the seventh century BC by Zoroaster (or Zarathusthra). In ancient Iran, two groups of gods were worshipped, the Ahuras and the Daevas. The message of Zoroaster was that Ahura Mazda, the Wise Lord of light, was the sole creator and lord of the world and that the worship of the Daevas was the worship of darkness and evil. Other ancient mythological gods were later revived throughout this land, the most noteworthy of them being Mithra (associated with the sun), and Anahita (associated with water and fertility) in addition to Ahura Mazda and his evil adversary Ahriman. The sacred literature of Zoroastrianism is found in the Avesta, only a small portion of which remains today. The followers of this religion were required to worship the sun four times a day in addition to the worship of the moon, fire and water. A complex collection of rituals and practices were associated with these gods. This religion was modified later by such as Mani (Manes), c.216-c.276 who called for monasticism and celibacy, and Mazdak (fifth century AD), who called for a socialistic group ownership of both money and women. People would enter into one another's homes, lay claim to their property and wealth and take liberties with their women. Unemployment and disenchantment prevailed, and the citizens were utilized by their rulers as cheap fodder for their armies. In their desperate search for a meaning for their pitiful existence these citizens experimented with every conceivable philosophy from Eicureanism to monasticism and everything in-between. All of this eventually lead to the development of vast rifts between the different levels of this society. During this period, bandits would sack the palaces of the rich, pillage and loot them and lay claim to the women. These new land owner's ignorance in matters of farming eventually lead to the ruin of the farm land. So disenchanted did the people become with the tyranny and abuse of their rulers that it later lead to a popular revolt by the farmers. The rulers of this empire ascended the throne of their fathers through inheritance, ruling with an iron hand, crippling taxation, and the theory that this ruler was a god, the descendant of gods. This ruler would surround himself with all manner of rare and precious possessions including gold, rare animals, precious jewelry, fine clothing, exquisite furniture, imperial palaces, endless slaves, and delicate cuisine. Their life was indeed the stuff that fairytales were made of, and it has been recorded that when this regime finally fell before the Islamic empire, their ruler Yazdegird III (r. 632-51) fled his land with one thousand cooks, one thousand musicians, one thousand trainers for his tigers, one thousand hawk trainers, and other members of his royal staff, all the while considering himself to be in a very miserable and pitiful state of affairs. In ancient times, this land had been the birthplace of many great advances in mathematics, astronomy, medicine, philosophy, and many other disciplines. However, over the centuries, a steady decline in moral values and religious knowledge eventually lead in the sixth century C.E. to what many historians consider to be its lowest state of decline. During this period nakedness became commonplace even in the temples. Women became public property and changed hands through gambling. If a woman's husband were to die her existence would lose all meaning and remarriage was prohibited for her for the rest of her existence. Higher levels of society developed the ritual of "Seti" which required a widow of a nobleman to burn herself to death as a sign of faithfulness to her deceased husband. 1) The religious elite, or priests, called the "Brahmins". They were considered superior to all others and sinless. 4) The Sudras, or peasants and laborers. There was also a fifth class called "Panchamas", or Untouchables. They include those whose occupations require them to handle unclean objects. It is speculated that the Untouchables were originally assigned such lowly tasks because of their non-Aryan origins. The law stated that if an untouchable stretched out his hand or his stick against a Brahman then his hand would be chopped off. And if he kicked a Brahman then his leg would be severed. And if an Untouchable claimed to teach a Brahman then he would be made to drink boiling oil. Under their law the punishment for the killing of an untouchable was equal to that of the killing of a frog, a crow, an owl, a cat, or a dog. The Untouchables were also forced to live outside the city. The Sudras were considered to have been created from the feet of the creator of the heavens and their purpose in life was to serve the higher classes. They were not allowed to own money, sit with a Brahman, touch him with their hand, or read the sacred books. The original religion of India was Hinduism. However, with time a more general state religion was created incorporating Buddhism and other faiths as well as Hinduism. So deeply engrained into this society did polytheism become that it is recorded that by the sixth century C.E. the inhabitants of this land had adopted over 330 million gods (L.S.S. O'Malley, Popular Hinduism, the Religion of the Masses, Cambridge, 1935, pp. 6-7). During this era, anything grand, or anything wonderful, or anything useful was worshipped as a god. The Arabs during this century has sunk to a very low state. They became obsessed with intoxicants, gambling, and idol worship. Girls became such a disgraceful commodity among them that they would bury their infant girls alive for fear of disgrace. Women in this society became a commodity that was inherited by her husband's heirs just as they would inherit his money or livestock. Men could marry an unlimited number of women, and would sometimes kill their own children if they feared they would cause them poverty. The men would further designate specific foods that were for their personal consumption and prohibited upon their wives or children. Slavery and treachery were rampant throughout the land. Tribal feudalism became commonplace, and great battles would be waged over the outcome of a horse race or other trivial matters. Over the centuries, the house that Prophet Abraham and his son Ishmael had built in Makkah (the Kaaba) was taken by these people as home for their idols and their pagan worship. By the time Muhammad (pbuh) came, 360 idols had been fashioned and placed inside and around the Kaaba, and the surrounding tribes had distorted the pilgrimage first instituted by prophet Abraham into a pagan ritual of running naked around these idols while whistling and clapping. The pagans of Arabia continued to believe in God, however, they regarded Him as the "supreme" god and felt it necessary to set up "intermediary" gods (idols) who would "intercede" with God/Allah for them. Muhammad (pbuh) was born on Monday the 12th of the month of "Rabi-AlAwwal" "The Year of the Elephant" ("A'am al-Feel" in Arabic) which corresponds roughly to April 20, 571. The reason it was given this name was because it was the year when Abraha Al-Ashram, the local governor of the Ethiopian protectorate of al-Yemen, mounted his elephant and lead his army in an attempt to storm Makkah and destroy the Kaaba. Muhammad's father's name was Abdullah and his mother's name was Amina the Daughter of Wahab. His full name was Muhammad the son of Abdullah the son of AbdulMuttalib the son of Hashim the son of AbdulManaf the son of Kusai the son of Kilab the son of Murrah the son of Kaab the son of Luai the son of Ghalib the son of Fihir the son of Malik the son of Al-Nadhar the son of Knana the son of Khuzaima the son of Mdraka the son of Ilias the son of Mudir the son of Nizar the son of Ma'ad the son of Adnan. The ancestry of Adnan goes back to Ishmael the son of Prophet Abraham (pbut). Muhammad's grandfather, AbdulMuttalib, was the leader of the tribe of Quraish, the noblest of the tribes of the region, and his mother was a woman of prominent nobility and ancestry in the same tribe. Muhammad's father, Abdullah, died before he was born and never saw him. Just before his birth, Muhammad's mother Amina had a dream wherein she saw a light issuing forth from her and illuminating the palaces of Basra. As was the custom in that day, upon his birth Muhammad's mother Amina sent him to live the first years of his life in the desert in order to learn the pure uncorrupted classical Arabic and to breathe the fresh desert air far from the boundaries of the city of Makkah. For the first two years of his life he nursed from Halima Al-Saadia. At the end of the two year term Halima asked his mother to allow him to remain with her a while longer and she consented. Muhammad's (pbuh) mother Amina died when he was six years old and was followed shortly thereafter by his grandfather AbdulMuttalib when he was eight years old. At this point, he went to live with his uncle AbuTalib and his three cousins Ali, Jaafar, and Akeel. Under the guidance of his uncle he learned to be a sheepherder and a tradesman. As he grew up he earned a reputation for honesty, fairness, humbleness, and integrity. It was not long before the people of Quraish gave him the nickname of "Al-Ameen" ("The Trustworthy"). When Muhammad (pbuh) was about sixteen years old he entered into the employ of Khadeejah the daughter of Khuwailid, a widow, a prominent businesswomen, and one of the nobles of Quraish. Upon reaching the age of twenty five, he married her. It is estimated that she was approximately forty years old when he married her. She became the mother of all of his children except Ibraheem. Their children were Al-Qasim, Abdullah (Al-Tahir/ Al-Tayyib), Zainab, Rukayyah, Um-Kalthoom, and Fatima. After the death of Khadeejah, Muhammad married Maria the Coptic who gave birth to his last child, Ibraheem. One of the first signs of Muhammad's wisdom and diplomacy came when he was thirty five years old. The tribes of Quraish found it necessary to rebuild the Kaaba in order to prevent it from collapse. When they got to the point in the construction when it was necessary to insert the "Black Stone", the tribes began to contend with one another for the honor of placing the stone in its place. This continued for a number of days until the situation became extremely volatile. Blood pacts were consummated between the various tribes to fight to the death and all-out war was on the verge of breaking out between them over this matter. At this point they came to a peaceful compromise. They agreed that the first person to enter the door of the holy mosque shall choose the one who shall receive this honor and they shall all abide by his judgment. As it happened, the first person to enter the holy mosque was Muhammad (pbuh). Upon seeing him the tribes all breathed a sigh of relief and proclaimed: "It is Al-Ameen (The trustworthy), we accept him! It is Muhammad!." Muhammad called for a garment, laid it upon the ground, and then placed the stone in the middle of it. He then asked all of the tribes to select a single representative from their tribe who was then asked to grasp an edge of the garment. All of the chosen representatives then carried the stone together to the Kaaba. 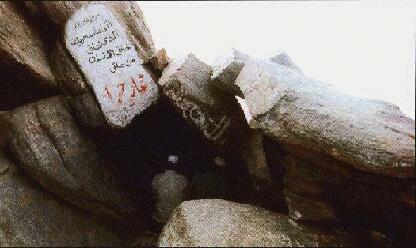 When they reached it Muhammad (pbuh) rolled it in place. It is narrated that the first signs of Muhammad's prophethood was a series of visions he would receive at night which would then come true exactly as he had envisioned them. Fig. 9 The cave of Hira where Muhammad first became the prophet of Islam. The story of the first visit of the angel Gabriel to Muhammad (pbuh) has been narrated in detail in section 6.2. Immediately after receiving this visit, Muhammad (pbuh) ran back home to his wife, trembling and in a state of terror crying "Cover me! Cover me!". When he had had a chance to calm down, Khadeejah asked him what had happened and he told her the whole story. Muhammad's wife Khadeejah was very well acquainted with his character and when this story was narrated to her and she saw the terror in his eyes she said: "No, by Allah! God shall not disgrace you. You do good by your kin, carry the burdens of others, give to the needy, aid the weak, and assist in all good things." However, as she did not know exactly what to make of this matter, she decided to ask the advice of her Christian cousin, Waraka the son of Nawfal. When Waraka heard what had happened he said: "By Him in who's hands my soul rests, you are the prophet of this nation, and the one who visited you is none other than the chief of the angels who visited Moses. Verily, your people shall call you a liar, abuse you, expel you, and wage war against you." When Muhammad (pbuh) heard these words he was bewildered, for he knew of his noble standing with his people, their great respect and admiration for him, and how they called him "The Truthful, the Trustworthy," so he asked Waraka: "Will they expel me?." Waraka replied "Yes! Never has there come a man before you with similar to that which you have come with except his people fought him and waged war against him. If I were to live to that day, I shall stand by you and assist you mightily." However, Waraka died shortly thereafter. "Therefore expound openly that which you are commanded, and be heedless of those who associate partners with God." Upon receiving this command, Muhammad (pbuh) climbed to the top of the hill of Al-Safa and shouted at the top of his lungs: "Ya sabaha!." This call was well known to be a call of dire distress and impending peril. It was usually reserved to warn of a siege by a hostile army. "O children of Abdul-Muttalib, O children of Fihr, O children of Kaab, if I were to warn you that at the bottom of this hill are horses [of war] about to attack you, would you believe me? ." Then Muhammad said: "Then [be notified that] I am a warner, before me is a terrible punishment." Everyone fell silent and did not know what to say until one of the nobles, Muhammad's uncle Abu Lahab, blurted out: "Damn you the rest of the day! Is this why you assembled us?" From that day forward, Muhammad (pbuh) called to Islam openly and without fear. With time, more and more people began to accept this call and became Muslims. Most of them, however, were of the poor, the weak, and the destitute of Quraish. In the beginning, the nobles did not pay him much heed until they learned that he was deriding their idols. This is when their animosity and their campaign of retribution began. At first, the nobles tried to convince Muhammad's followers that he was a lunatic or a magician. However, when this method did not succeed they resorted to physical abuse and torture. Those of them who had no clan to protect them were subjected to the worst of this torture. Many were whipped, stoned, beaten, starved and burned. The nobles took great pains to come up with new and innovative ways to torture them. Among these was the method employed by Umayya against his slave Bilal the Ethiopian. He would take him out to the desert at the hottest time of day, lay him on his back under the scorching sun, then order that a large boulder be rolled onto his stomach. All the while Bilal remained resolute, repeating: "[God is] one, [God is] one." At the same time, the tribe of Makhzoom would take the family of Yasir, the father the mother and the son, out to the desert during the midday heat and torture them severely. While this was going on, Muhammad (pbuh) would pass by them and say: "Have patience family of Yasir. Your appointment is with heaven." Khabbab ibn Al-Art narrated that: "They used to take me out, light a fire, and then roast me over it. A man then came and placed his foot on my chest extinguishing the fire with my back." It was well known in the Arabian peninsula that one does not attack or abuse members of a strong clan or tribe for fear that that tribe might seek retribution. Those who did not belong to such a tribe would enter into a pact of protection with a noble of a strong clan or tribe. In such a manner people would protect their families and wealth from the aggression of their neighbors. When Quraish first began its campaign of persecution of Muhammad (pbuh) and his companions many of them sought protection by allying themselves with non-Muslims in this manner. For example, Abu Bakr Al-Siddiq had allied himself with ibn Al-Daghnah, and Uthman ibn Madhgoon allied himself with Al-Waleed ibn al-Mugeerah. Muhammad (pbuh) himself was under the protection of his uncle Abu-Talib. This protection by no means protected them from all abuse, however, it did afford them a measure of protection against the severest torture or murder. It is worth mentioning though that both Abu-Bakr and Uthman both felt such protection by non-Muslims inappropriate and later renounced that protection in favor of the protection of Allah Almighty. Because of the continuous and unrelenting persecution of Quraish towards the Muslims, it was next to impossible for any among them to publicly declare his acceptance of the faith much less call others to Islam. One day the companions of Muhammad (pbuh) gathered together and said to one another "By Allah, Quraish has yet to hear this Qur'an recited to them out loud, so who among you shall recite it to them?" Abdullah the son of Masood volunteered: "I shall do it." They objected: "We are afraid that they might attack you, we want someone who has a strong tribe or clan to protect him if they decide to harm him." Abdullah replied: "Let me be the one, God shall protect me." "In the name of Allah, Most Compassionate, Most Merciful. The Most Compassionate! [He] has taught the Qur'an. He created man. He taught him eloquent speech ..."
As Abdullah continued to recite the Qur'an the nobles of Quraish asked one another "What is he saying?" Then one of them said "He is reading part of that which Muhammad has brought!" So they all sprang up and began to strike him about his face, all the while he continued to recite this chapter to them until he felt that they had heard enough. When Abdullah returned to the Muslims and they saw the marks which the beating had left on his face they said: "This is what we feared would happen to you." Abdullah replied: "The enemies of Allah have never been more impotent against me than they were today, and if you wish I shall return and recite before them its equivalent tomorrow!" They responded: "No, that is enough. You have spoken to them words which they hate [to hear]"
However, if this was the situation of the followers of Muhammad (pbuh) then how was Muhammad himself treated by these people? The nobles of Quraish consolidated all of their resources in an effort to stamp out Muhammad's message. They told everyone he was a liar, a magician, a poet, and a lunatic. They sat in the streets and did their utmost to terrify the people of Muhammad and bar them from speaking to him. They tortured his friends and did their best to constantly abuse him. They would throw thorns and sharp objects in his path, dump camel entrails on his head while he prayed to God, curse and swear at him whenever they saw him, starve him and his companions, and even attempted to kill him. With time the nobles of Quraish even chose to change Muhammad's name from Muhammad (the praised one) to Muthammam (The reviled one). Thus, whenever they would speak of him they would say: "Cursed be the reviled one" etc. For this reason, Muhammad (pbuh) used to say to his Companions: "Do you not marvel at how Allah has even deflected their curses from me? They curse Muthammam and I am Muhammad"
When this continued for a long while the nobles of Quraish went to Muhammad's uncle Abu-Talib and attempted to bribe him to renounce his protection of Muhammad (pbuh). When this did not succeed, they went to Muhammad directly and attempted to bribe him with wealth, leadership, nobility, and to appoint him as their leader if he would but renounce his message. He refused. When the torture of Quraish became unbearable, Muhammad (pbuh) authorized his companions to emigrate to Ethiopia (Abyssinia) . At this point eighty three Muslims fled Makkah and traveled to Ethiopia. When Quraish received news of their emigration they sent a delegation to Negus (Al-Najashi) the Christian king of Ethiopia with many gifts in the hope that they might persuade him to return the emigrants to them. A famous exchange occurred between the three parties with the outcome being the refusal of the king to deliver the Muslims back into the hands of Quraish. This could be deemed the first strategic victory of the Muslims against their persecutors, so let us hear this story. When the nobles of Quraish saw that the Muslims had found a reprieve from their torture and abuse in Abyssinia and that they were allowed to practice their religion freely there, these nobles decided to send a delegation to the King of Abyssinia consisting of Abdullah the son of Rabia and Amr the son of Al-Aas, and with them they sent many gifts for the king and his generals. "There has come to your land a scrapping lot of our most ignorant juveniles. They have departed from the religion of their fathers and have not accepted your religion, rather, they have invented a completely new religion which neither we nor you have heard of before. The nobles among their people, their fathers, their uncles, and their clan have sent to you to return them to them, for they are best acquainted with them and closer in bond to them." The king's officers then spoke up saying: "They have spoken the truth O king so let us return them to their people." "What is this religion which has caused you to relinquish the religion of your fathers and not to accept our religion nor any of these other faiths?" Ja'far the son of Abu-Talib, the cousin of Muhammad (pbuh) then arose and said: "O King of Abyssinia, We used to be a people of ignorance, worshipping idols, eating dead animals, performing indecencies, casting off family bonds, doing evil to our neighbors, and the strong among us would eat the weak. This remained our common trait until God sent to us a messenger. We knew his ancestry, his truthfulness, his trustworthiness, and his chastity. He called us to Allah that we might worship Him alone and forsake all that which we had been worshipping other than Him of these stones and idols. He commanded us to be truthful in speech, to keep our trusts, to strengthen our family bonds, to be good to our neighbors, to avoid the prohibitions and blood, and to avoid all indecencies, lying, theft of the orphan's money, and the slander of chaste women. He further commanded us to worship Allah alone, not associating anything in worship with Him. He commanded us to pray, pay charity, and fast (and he listed for him the requirements of Islam). So we believed him, accepted his message, and followed him in that which he received from Allah, worshipping Allah alone, not associating any partners with Him, refraining from all prohibitions, and accepting all that which was made permissible for us. For this our people greeted us with animosity and vindication. They tortured us and persecuted us in our religion in the hope that they might turn us from the worship of Allah to the worship of idols, and that we might accept that which we had accepted of old of our evil deeds. So when they overcame us, dealt unjustly with us, restricted us, and bared us from our religion, we fled to your land and chose you above all others, hoping for your sanctuary, and hoping that we would not fear injustice in your presence. " "Kaf, Ha, Ya, Ain, Saad. [This is a] recital of the mercy of your Lord to His slave Zachariah. When he called unto his Lord a call in secret. Saying: 'My Lord, indeed my bones have grown feeble, and my head glistens with gray hair, and I have never been unblessed in my supplication unto you my Lord. And verily, I fear [what] my relatives [shall do] after me, and my wife is barren, so grant me from Yourself an heir. Who shall inherit me, and inherit from the family of Jacob, and make him O Lord one in whom You are well pleased.' [Allah said:] O Zachariah! Verily We give you glad tidings of a son whose name is Yahya(John). We have granted this name to none before him. He said: 'My Lord, whence can I have a son when my wife is barren, and I have grown quite decrepit in old age?' He said: 'So has your Lord said. It is trivial upon Me. [Indeed,] I had created you previously when you were nothing..."
When the king heard these verses he wept till he soaked his beard, and with him his Bishops also wept. The king then said: "Verily, this and that which was brought by Jesus have indeed come from the same burning light." He then turned to the emissaries of Quraish and said to them: "Return to your people, for I shall never deliver them to you"
Then next morning, Amr the son of Al-Aas returned to the king and said: "They say a most monstrous thing regarding Jesus the son of Mary." At this the king summoned the Muslims again and asked them: "What do you have to say regarding Jesus the son of Mary?" Ja'far the son of Abu-Talib replied: "We say in his regard that which our prophet says: That he was the servant of God and his messenger, a spirit from Him, and His Word which He bestowed upon Mary the chaste, the pure." Upon hearing this the king struck the ground with his hand and lifted up a stick. He then said "Verily, Jesus the son of Mary did not surpass what you have just said even so much as this stick." The king granted the Muslims sanctuary and the emissaries of Quraish returned with empty hands. This king of Ethiopia later passed away during the lifetime of Muhammad (pbuh). When Muhammad learned of his death, he commanded the Muslims to assemble for a congregational "prayer upon the deceased" (funeral prayers) on the king's behalf. While all of this was going on in Ethiopia, Muhammad (pbuh) and his companions who had chosen to remain behind in Makkah continued to endure the punishment and torture of Quraish. However, their numbers continued to increase with every passing day in spite of the best efforts of Quraish. Many of those who converted to Islam were nobles among them such as Umar ibn al-Khattab. In the seventh year of Muhammad's (pbuh) message, the nobles of Quraish became desperate to stop the growth of Islam in their city, so they all met together and wrote the "Sanction of Hashim and Banu Muttalib." In this pact, the nobles all agreed to neither buy the goods of the sons of Hashim and Banu Muttalib (the tribe of Muhammad), nor to sell to them. They further agreed not to marry from them nor to allow them to marry from their tribes. This document was then hung inside the Kaaba. This sanction continued for three years. During this period, the children of Hashim and AbdulMuttalib suffered severely until they were reduced to eating the leaves off of the trees. They could neither buy nor sell goods from Quraish and Quraish prevented all other merchants from dealing with them except at exorbitantly high prices. Although the Arabs of this time period had become steeped in many evil traits, nevertheless, they were also known for a number of good ones as well. Among these was a limited sense of honor and justice prevalent among many of them. It was this trait which finally drove a number of people of Quraish, among them Amr ibn Rabeea, to collect a number of like-minded people in order to pressure the nobles who had signed the sanction into nullify it. When the people then rose to tear up the document they found that the insects had eaten it except for the following words at its top: "In your name O Lord..."
In the tenth year of the message, Muhammad's uncle Abu-Talib and his wife Khadeejah both died With their death the abuse of Quraish multiplied greatly. Of those few people who were allowed to hear the Qur'an many became Muslims. However, the continuous and unrelenting torture of Quraish towards the Muslims drove Muhammad (pbuh) to seek an ally for them to protect them against Quraish and allow the people to hear the message of Islam. So he traveled to Al-Taif in search of the protection of the tribe of Thaqeef and with the hope that they might accept his message. He presented his message to Ibn Abd-Yalayl ibn Abdu Kulal and the nobles of Al-Taif. They, however, met him with curses and abuse. They then roused the citizens and enflamed their passions against him till they stoned him out of their city and he fled from them into a farm belonging to Utba and Shaiba the sons of Rabeea. These two watched him from a distance as he sat below one of their grape arbors and supplicated to Allah. "O my Lord, unto you I bewail my weakness, inability, and disregard of mankind towards me. O Most Merciful of the merciful, you are the Lord of the weak and my Lord. Unto whom shall you deliver me?. Unto one who is distant and shall glower at me, or unto an enemy whom you have given authority over me? If you are not angry against me then I do not care [what befalls me], but your [gifts of] well being are more commodious for me. I seek refuge in the light of your face that has overcome all darkness, and through which all matters of this life and the hereafter have been established in justice, that your retribution should fall upon me, or your disdain should befall me. Unto you is [all] appeasement until you are appeased, and no one has power or ability except in You"
When Urwa and Shaiba saw this they said to one another: "Verily, he has quite corrupted our slave boy." When Addas returned to them they said to him: "Fie upon you Addas! Why did you kiss the man's head, hands and feet?" Addas replied: "O masters, there is nothing in this earth better than this matter. He has told me of a matter which is only known to a messenger" They rebuked him saying: "Fie unto you Addas! Do not allow him to divert you from your religion. Your religion is far better than his!" Muhammad (pbuh) then departed and returned home practically overwhelmed with excessive sorrow. On his way home he stopped in Qarn ath-Tha'alib, as he looked up, he saw a cloud shadowing him and he saw angel Gabriel in it. Angel Gabriel then addressed him saying: "Allah has heard what your people said to you, and how they have replied to you. Allah has sent the Angel of the Mountains to you so that you may order him to do whatever you wish to these people." The Angel of the Mountains then called out greeting him and then said, "O Muhammad! Order what you wish. If you like, I shall cause al-Akhshabayn (two mountains surrounding Al-Taif) to fall upon them." The Prophet (pbuh), replied "No, for I hope that there shall be among their children those who will worship Allah alone, and will worship none besides Him." He then returned to Makkah and to the abuse of its people. Shortly thereafter, Allah Almighty sent for Muhammad (pbuh) who was taken to the "Furthest Mosque" ('Temple mount' in Palestine) and then up into the heavens where he met the prophets of God, saw many of the signs of God, and then the five prescribed daily prayers were prescribed upon him and all Muslims. All of this happened in one night which was later called the night of "Israa and Miraj" (travel by night and ascension). Muhammad (pbuh) continued to call the surrounding tribes to Islam and to the aid of the Muslims at every possible opportunity. During the trading season when the surrounding tribes would all convene in Makkah, Muhammad (pbuh) would go out, speak to them and encourage them to accept Islam. All the while his uncle, Abu-Lahab, would follow him around. Whenever he spoke to a tribe or invited them to Islam, Abu-Lahab would stand in his way and do his best to dissuade them. When Muhammad (pbuh) would speak to one of these tribes, he would tell them that he was the messenger of God and that he had been sent to guide them out of their ignorance and out of the worship of idols into the light of God and the worship of one single God, the Creator and Sustainer of all creation. He would then recite to them the Qur'an and encourage them to accept Islam. One of the tribes who eventually met Muhammad in this manner was the tribe of Al-Kazraj of the city of Al-Madinah Al-Munawara (called Yethrib at that time). When they heard Muhammad's claims they began to remember the prophesies of the Jews in their city and how the Jews were continually threatening them with the impending arrival of their "final prophet" who would lead them to a great victory over them and establish the kingdom of God on earth. "And when there came to them (the Jews) a Book from God, confirming that which is with them,- although before that they were praying for victory against those who disbelieved,- so when there came to them that which they recognized, they refused to believe in it. So [let] the curse of Allah [fall] on those who disbelieve." The citizens of Al-Madinah then returned home and spread the word. The next year, twelve of them returned and gave Muhammad (pbuh) their pledge of submission and acceptance of his message. This was called "The first pledge of Al-Aqaba"
When this delegation left to return to their people, Muhammad (pbuh) sent with them teachers who taught the people of their city the Qur'an and the religion of Islam. This continued for one year until there was hardly a house in Al-Madinah except there were people in it who had accepted Islam. At the end of the year the people sent another delegation to Muhammad (pbuh) consisting of seventy five representatives. They gave Muhammad the famous second pledge of Al-Aqaba, the "pledge of war." In it they pledged to protect Muhammad and his companions within their city with their wealth and their might no matter what the cost to themselves and their families, and to protect them as they would protect their own wives and children. Upon receiving this pledge, Muhammad (pbuh) authorized his followers to emigrate to Al-Madinah (for more see section 6.4). "We used to have a Jewish neighbor from the tribe of Abd-Alash'hal. One day he left his house and came out to talk to some members of the tribe of Abd-Alash'hal. At that time I was the youngest among them. I was wearing a mantle of mine and laying on it in my family's yard. He (the neighbor) then began to make mention of Judgment Day, the resurrection of all mankind, judgment, the scales, Paradise, and Hell. He was saying all of this to a tribe of polytheist, followers of idols, people who did not believe in an afterlife or a resurrection after death. For this reason they replied to him: 'Do you really believe that all of this shall come to pass? Do you really believe that mankind shall be resurrected after their death to a place where there is a Paradise and a Fire to be rewarded for their deeds?' He replied, 'Yes, by He in whom we testify!.' He continued that he would prefer to be roasted in the most tremendous furnace in this earthly life rather than have to endure the fire of Hell in the hereafter. The others then replied: 'What then is your proof of what you say?' He replied 'A prophet who shall come from that vicinity' and he pointed in the general direction of Makkah and Yemen (South). They replied 'And when shall we see him?' He looked at me, a young child, and answered 'If this child reaches his prime he shall see him'" Salamah then continued "By Allah!, night and day did not pass but Muhammad had become the messenger, and he was alive among us. We then believed in him and accepted him but he disbelieved in him and rejected him out of transgression and envy. We then said to him one day '[what is the matter with you?] Are you not the same one who previously told us so much about him?' He replied 'Yes! but he is not the one.'" "Do you know the story of how Thalaba the son of Sa'iah, Usaid the son of Sa'iah, and Asab the son of Ubaid, the children of the tribe of Hadal the brethren of Bani-Quraidah, became Muslims?" He said "I replied: No I do not." He said: "There was once a man from the children of Israel who came to us from the land of Al-Sham (Babylon, Palestine, etc.). His name was Ibn-Alhai'iban. He came to us two years prior to the beginning of Islam. As he lived among us we never before saw a man better or more devout in his daily worship than he. Whenever rain would be withheld from us we would go to him and say to him: Go out O Ibn-Alhai'iban and pray to God to grant us rain. He would reply: I shall not do so unless you agree to pay out of your harvest a charity [to the needy]. We would ask him, how much? And he would reply a 'Saa' (weight) of dates or two 'Muud' (weights) of wheat. He said: So we would pay this charity and he would accompany us out to the edge of town and beseech God on our behalf. Before he would rise to leave a cloud would overshadow us and the rain would begin to pour. He did this for us not once, or twice, or even three times [but more]. When he was on his death bed and he knew that he was about to pass away, he said: O children of Israel, what do you think drove me to leave the land of wine and leavened bread to come to the land of wretchedness and hunger?. They replied: 'You know best' He said: Then know that I only came to this land in anticipation of a prophet of God whose time has drawn near, and this land is the destination of his emigration (see chapter 6). I had hoped that his time might come so that I might follow him. So do not allow anyone to beat you to him O children of Israel for he shall be sent to spill blood and to take as spoils the women and children of those who oppose him. Therefore do not allow that to prevent you from him. When Muhammad was sent, and when he surrounded Bani-Quraidah, these young men who had attended his speech told their people: 'By Allah!, this is indeed the prophet which Ibn-Alhai'iban told you of.' They replied: 'It is not him.' They returned: 'But it is!, and it is his description.' So these [three] young men left their people and accepted Islam." When the Muslims received authorization from Muhammad (pbuh) to emigrate to Al-Madinah, they began to flee in droves under the cover of night for fear that they might be discovered by Quraish. Those who fled Makkah were from that day forward named "Al-Muhajireen" (The Emigrators). When they departed from Makkah they left behind all of their wealth, their livestock, and their homes. The people of Quraish wasted no time in claiming this property and their zeal in amassing their newfound wealth helped to occupy them from setting out in pursuit of the Muslims who had fled with only the clothes on their backs, enough provisions for their trip, and an undying love of God burning brightly in their hearts. Although the Muslims had forsaken all of their worldly possessions to the people of Quraish, still, this did not prevent many of them from being captured and tormented by Quraish. Hind the daughter of Abi-Umayya Huthaifah ibn Al-Mugeerah Al-Qurasiyya Al-Makhzoomiyya (more popularly known as Um-Salama) was one such victim. She was married at the time to Abdullah ibn Abdulasad, one of the first ten converts to Islam. They had a son named Salama. Upon receiving the authorization to emigrate to Al-Madinah, Abdullah collected some provisions, placed his wife and son on the back of their camel and set out for Al-Madinah. As they reached the outskirts of the city some of the men of the tribe of Makhzoom (the tribe of Um-Salama), saw them. They came running and said: "Although we may be powerless to stop you, still, you shall not be allowed to take our daughter and travel throughout the land with her," and they wrenched the reins of the camel from his hands. As this was going on, a group of men from the tribe of Um-Salama's husband Abdullah, the tribe of Abdulasad, became enraged by this display and shouted: "By God, if you take her you shall not take his son, the son of our tribe" and they wrenched the boy away. Both tribes then began to pull on the boy until they dislocated his arm. Finally, the tribe of Makhzoom took Um-Salama and the tribe of Abdulasad took her son Salama, and they both left Abdullah with no recourse but to flee to Yethrib alone. After that, Um-Salama would go out every day to the edge of the city and weep over the loss of her son and her husband until well into the night. This continued for about a year until the tribes finally had mercy upon her, returned her child to her and allowed them to catch up with her husband. Another example is that of Suhaib Al-Roomi of the Arab tribe of Numair. As a child he had been taken captive by the Romans in one of their raids on the city of Al-Thani in Iraq. After spending many years as a slave in the service of the Roman nobles he escaped and returned to Arabia. He came to Makkah as an emigrant barely remembering a single word of Arabic. Due to his heavy accent and his bright red hair he was given the nick-name of "Al-Roomi" (The Roman). Suhaib spent many years in Makkah bartering and trading, and eventually he managed to amass substantial wealth. During his stay in Rome, Suhaib had once heard a Christian priest commenting to a Roman noble that the time was near when a final prophet of God would be coming from the land of Arabia and would confirm the message of Jesus (see chapter 6). When Suhaib later heard of Muhammad's message he inquired after him and ultimately, he accepted Islam. When Muhammad (pbuh) authorized the emigration to Al-Madinah Suhaib collected his belongings, and set out for Al-Madinah. However, the nobles of Quraish had heard of his intentions and prevented him from leaving the city. They then set up a continuous guard to ensure that he would not leave the city, nevertheless, through his cunning he later managed to elude them and leave. It was not long after that Quraish learned that Suhaib had tricked them and escaped, so they sent out their best riders on their fastest horses in heated pursuit of him. Somewhere along the road to Al-Madinah they caught up with him. Upon seeing them Suhaib dismounted, pulled out his bow and arrows and called to them: "O people of Quraish. By Allah, you know that I am a very skilled archer. By Allah, you shall not reach me until I kill with each arrow in my quiver a man among you, and then I shall smite you with my sword until it falls from my hand." The detachment of Quraish replied: "You came to us as a lowly emigrant with no money. Now that you have prospered by way of us you wish to leave? By Allah, we shall not allow you to leave with your life and your wealth!" Whereupon Suhaib replied: "If I were to deliver my wealth to you, will you let me be?" They replied "Yes." So Suhaib revealed to them the location where his wealth was buried and they retrieved it and let him go. When Suhaib reached Quba (a city located two miles from Al-Madinah), Muhammad (pbuh) saw him and hastened to greet him saying: "You have indeed prospered in your trade O father of Yahya, you have indeed prospered in your trade." When Suhaib heard these words he replied: "By Allah, no one has beat me to you [with this news]. You have not been informed of it except by way of [the angel] Gabriel." All of the Muslims in Makkah emigrated in secret and under the cover of night out of fear of the persecution of Quraish. All, that is, except Umar ibn Al-Khattab. Umar was a powerful man and greatly respected by Quraish. He was ambidextrous and highly skilled in matters of war. When he resolved to emigrate he stood up in the middle of the holy mosque in Makkah in front of its nobles and proclaimed: "I have resolved to emigrate. Let he who wishes his parents to lose their child or wishes to make his children orphans, let him meet me behind this hill," and he departed. Of course, no one followed him. After Muhammad (pbuh) authorized the Muslims to emigrate to Al-Madinah, all able bodied Muslims departed until there was no one left behind except himself, his close friend Abu-Bakr, his cousin Ali, and those who had been persecuted and imprisoned. When Quraish saw that Muhammad (pbuh) had found a strong ally and a tribe that would protect him and his followers from their persecution they began to fear that he might leave and join them. They decided that extreme measures were necessitated in order to prevent this from happening. It was time for Muhammad to die. The nobles of Quraish met in "Dar-Alnadwa" and plotted as to how they shall execute this deed. They decided that the best strategy was to choose a young and capable representative from each of their tribes and to dispatch these representatives to his home. They would all then strike Muhammad (pbuh) with their swords simultaneously such that his blood would be distributed between all of the tribes. In this manner, the children of AbdulManaf would not be able to take vengeance against all of the tribes of Quraish combined. Gabriel visited Muhammad (pbuh) and informed him of this plot, so Muhammad requested from his cousin Ali that he take his place in his bed and he informed him of this plot. He consoled him not to worry, no harm shall befall him. "YaSeen. By the Qur'an full of Wisdom, Truly you [O Muhammad] are one of the messengers. On a straight path. [This is] a Revelation sent down by the All-Mighty, the Most Merciful, that you may warn a people that which their forefathers were warned, but they are heedless"
until he reached the verse "And We have set a barrier before them and a barrier behind them, and [thus] we have covered them so that they see not." A man then passed by them and said "what are you waiting for here?" They replied "For Muhammad" He responded "He has already departed and left dust on your heads." They then placed their hands upon their heads and found the dust. So they peered inside the house and saw Ali in the bed and thought he was Muhammad The next morning Ali got up out of the bed and they realized that Muhammad (pbuh) had indeed escaped just as that man had told them. They quickly set out in his pursuit. "O Abu Bakr, what shall you think of two [men] the third of whom is God? [through guidance and protection]"
"If you help him not [it matters not], for Allah helped him when those who disbelieved drove him forth, the second of two; when they two were in the cave, when he said unto his comrade: Grieve not. Verily! Allah is with us. Then Allah caused His peace of reassurance to descend upon him and supported him with troops you did not see, and made the word of those who disbelieved the nethermost, while Allah's Word is the highest. For Allah is Exalted in Might, Wise." Muhammad (pbuh) and Abu-Bakr remained inside the cave for three days while Abdullah the son of Abu-Bakr brought them news of the plotting of Quraish. His daughter, Asma, would also bring them food every day. After three days, they took a guide by the name of Abdullah ibn Arqat and set out for Makkah. At times Abu-Bakr would walk behind Muhammad (pbuh) and at others he would walk in front of him. Finally, Muhammad (pbuh) asked him about that and Abu-Bakr explained that at times he would fear that an attack would come at Muhammad from behind, so he would walk behind Muhammad (pbuh) to protect him. At other times he would fear an attack from in front of them so he would walk in front of him for the same reason. When Quraish realized that Muhammad (pbuh) had eluded they announced a reward of one hundred camels for anyone who would capture him and return him to them. Suraqa ibn Malik ibn Ju'ushum heard of this reward and set out in pursuit of Muhammad (pbuh). Suraqa was a skilled tracker and Muhammad (pbuh) and Abu Bakr had spent three days in the cave before departing, eventually he caught up with them. However, as he began to close in on them his horse tripped and fell. He then got up and mounted his horse, and again it tripped and fell. When this happened a third time his horse began to sink into the ground and a strong wind began to blow. When Suraqa saw this he realized that he would not be allowed to capture them. So he called out to them: "I am Suraqa ibn Ju'ushum. Will you allow me to speak to you? By Allah, I promise not to harm you" They asked him what he wanted and he replied: "I want you to write a pact for me that shall be a sign between me and you." Muhammad (pbuh) commanded that this pack be written and Suraqa took it and left. As he departed, Muhammad said to him: "conceal our location" and they parted ways. Suraqa never spoke to anyone about what had happened until many years later, after the Muslims captured Makkah. At that point, Suraqa returned to Muhammad (pbuh) with the pact in his hand and embraced Islam. 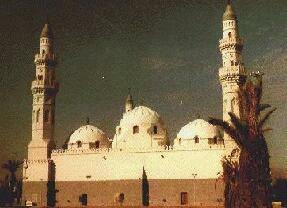 When Muhammad (pbuh) drew near Al-Madinah, he came upon the city of Quba (two miles away from Al-Madinah). Ever since the beginning of the emigration of the Muslims to Al-Madinah, the citizens of the city had been waiting with the utmost anticipation for his arrival. They had received word that he had left Makkah and was en route to them. Every day a party of them would go out to the outskirts of the city at daybreak and look for him, they would stay there waiting for him until the midday heat would force them indoors. Muhammad (pbuh) and Abu Bakr first arrived on Monday the 12th of Safar (the third lunar month). Muhammad was fifty three years old at the time. When they arrived the citizens had already returned home for the afternoon. The first person to see him called out at the top of his lungs announcing his arrival. Muhammad (pbuh) and Abu Bakr were men of similar age. Most of the citizens of Al-Madinah had never seen Muhammad (pbuh) in person, so they could not tell which one was him. When Abu Bakr realized this he stood over Muhammad (pbuh) and shaded him with his coat whereupon the people recognized Muhammad (pbuh). It is estimated that about five hundred people greeted them on that day and the people clamored on the roof tops trying to get a glimpse of him and crying: "Which one is him? Which one is him?" while the children and the slaves filled the streets shouting "God is great! God's messenger has come! God is great! Muhammad has arrived!" From the direction of "Thaniyyat al-Wada'a"
Kais Al-Kalby Delivers again, with a beautiful commentary! Summarizing, what The Holy Qur'an describes Prophet Mohammad (pbuh) having the ultimate manners and deeds through out his life. 17 Prophecies of Last Prophet Of God. Of all the prophets, our Prophet, Muhammad, was blessed with the most miracles. Al-Isra' and al-Mi^raj are among the many miracles of Prophet Muhammad.